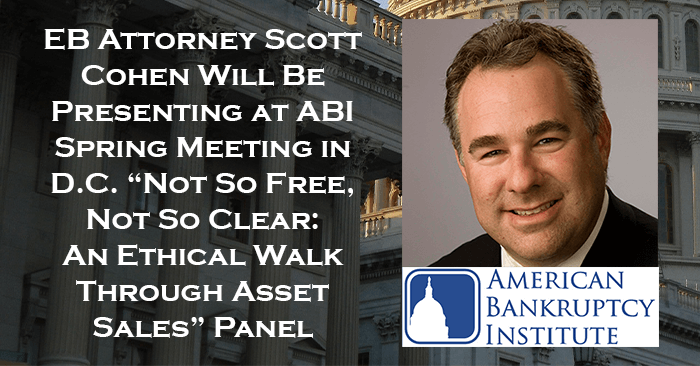 On April 12, 2019, Engelman Berger attorney Scott Cohen will be presenting at ABI “Not So Free, Not So Clear: An Ethical Walk Through Asset Sales” panel. This panel is a joint session between both the ABI Asset Sales Committee and the ABI Ethics & Professional Compensation Committee. Faculty will discuss the ethical problems facing counsel and their clients in § 363 sales including collusion, abuses during due diligence, and successor liability. The other panelists include Peter J. Barrett, the moderator, of Kutak Rock LLP; Peter J. Roberts of Fox Rothschild LLP; and Cynthia Romano of CR3 Partners LLP. ABI is known as the nation’s largest association of bankruptcy professionals. The organization is made up of more than 12,000 attorneys, bankers, judges, lenders, turnaround specialists, accountants and other professionals. Since 1982, ABI has provided congressional leaders and the general public with non-partisan reporting and analysis of bankruptcy regulations, laws, and trends. ABI also takes part in many education and research activities dedicated to the better understanding of insolvency.